Maggie McIntosh is a Senior Designer and Senior Construction Manager at Moontower Design Build in Austin, Texas. You’re probably wondering how one person could juggle those two very important roles at a design firm, but someone as talented as Maggie makes it look so very easy. Read on to find out her thoughts on enabling clients to be a part of the design conversation, considering the full story of a project. Full House or Family Matters? I’ve always been interested in buildings as an expression of identity. Empowering individuals and cultures to express themselves in the buildings they occupy introduces additional depth and meaning to everyday life. So much of what I do is education. When you give your clients the language to articulate what they want and enable them to be a part of the design conversation, your role becomes more about guiding them toward the best answers than authoritatively defining the solution for them. 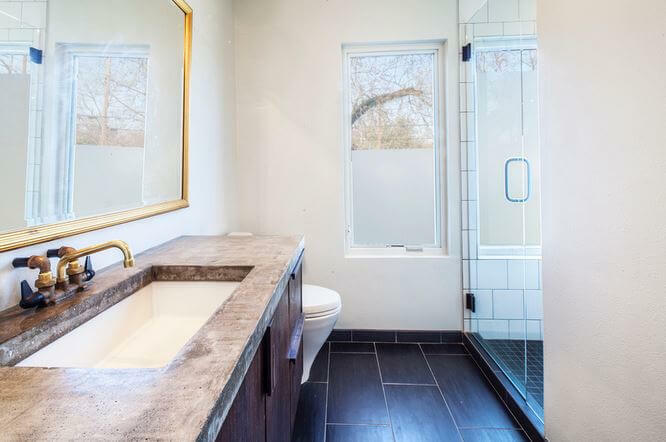 An incredibly gorgeous bathroom designed by Maggie McIntosh of Moontower Design Build. That’s hard to answer. In this field you often assist many times before you lead, so it’s hard to say what someone’s first professional project was. I guess I’d say it was the first one where I really took the reigns — a sizable house remodel in an upscale neighborhood in southwest Austin. There are a many things I’d do differently today. The greatest change would probably be my approach. The house had so much potential for indoor/outdoor spaces that went totally unexplored. I wish I’d taken a step back before attacking the wishlist the clients provided and thought about the project holistically, identifying unique potential and investigating creative ways to add value. Unfortunately, a lot of houses and buildings are just poorly built, especially many constructed over the past 40 years. Many builders and developers are too bottom-line focused, selecting materials and products based on what’s the cheapest. This short-sighted approach leads to problems for future users and shortens the life-cycles of our buildings, leading to more resource consumption and additional cost for later users. 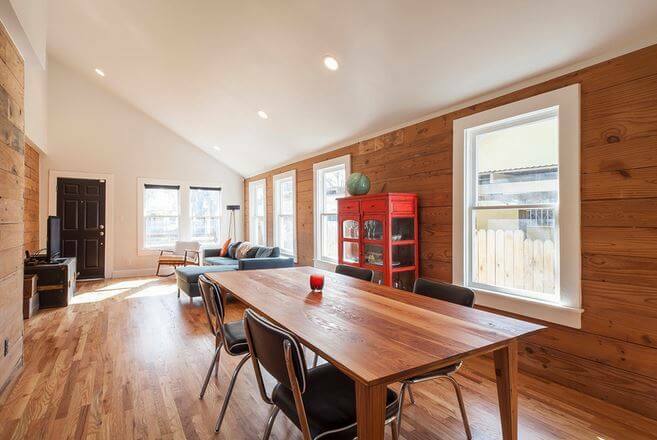 An open dining and living space in the Haskell home, designed by Maggie McIntosh of Moontower Design Build. My pet peeve is when people rush through a design project without being thoughtful about a home’s composition. Every project requires unique consideration. There is no silver bullet in design — you must consider the full “story” of the project and take time to consider each step forward, making sure it’s in sync with the big picture. I’m really liking that landscaping and outdoor living spaces are becoming more of a priority in residential design. We joke in the office that everything looks better with a vine on it, and there’s some truth to this. There’s something very satisfying about seeing how buildings interact with the organic landscape that surround them; directing the inevitable intrusion of plant life by curating the correct plants to grow in the appropriate location adds so much value to the spaces we create. 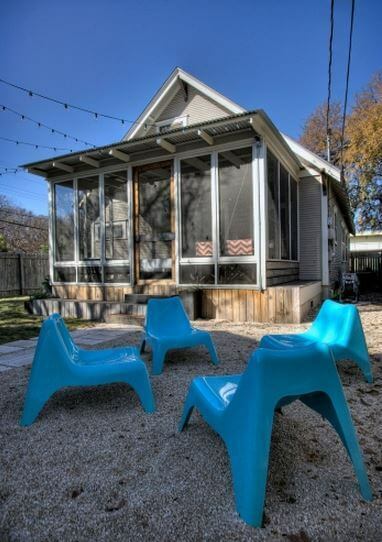 A cozy Austin backyard designed by Maggie McIntosh of Moontower Design Build. No rules except to have fun and always be willing to explore! Visits to construction sites in the morning, afternoon meetings with other team designers to discuss design progress on active design projects, maybe meeting a potential new client or doing a design consult end of day. But every day is unique: some days I find myself working on site with subcontractors all day and other times I’ll have meetings from 8-5. My father. He’s the most thoughtful and compassionate person I know. And Samuel Mockbee, one of the founders of the Rural Studio at Auburn University. Full House all the way! Want to see more of Maggie’s amazing work? We don’t blame you! Head on over to Moontower Design Build to check it out.